San Diego real estate hasn’t quite gone to the dogs–yet (though some inland neighborhoods may be coming close). How about bobcats taking over your home? But Riverside County’s real estate market is another animal entirely. (Lake Elsinore) Neighbors first noticed the feline squatters Aug. 27 hanging out on a side wall of the empty house in the Tuscany Hills development…. The foreclosed home is one of several on the block. Its lawn is brown but still being watered by the sprinklers. The house sits right up against barren, chaparral-covered hills. 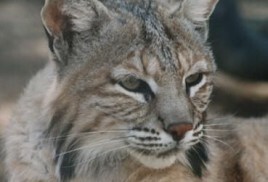 At least two adult bobcats and perhaps a litter of young ones appear to be occupying the house. Residents have mixed emotions about their new neighbors. They could have easily qualified for a loan last year….now they just squat. There are still some fat cats benefiting from the real estate market. They could have easily qualified for a loan last year. Now they just squat. This will be one REO with a bonus for the lender. Are Lenders Redlining Entire Cities?